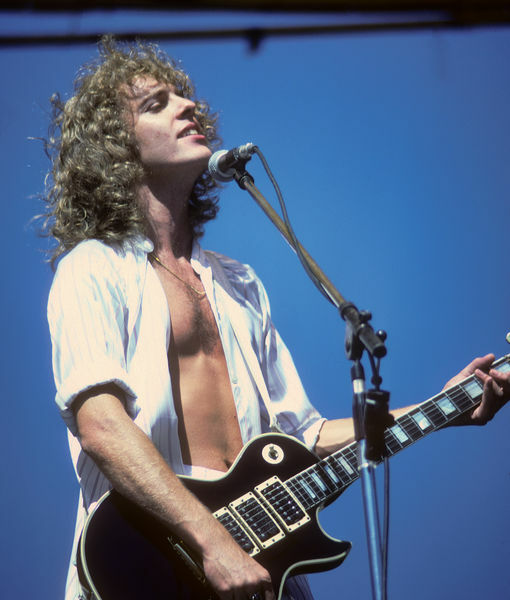 Legendary guitarist Peter Frampton, whose 1976 album “Frampton Comes Alive!” is one of the best-selling albums of all time, is announcing that his next tour will be his last — and is speaking out for the first time about why. The 68-year-old told “CBS This Morning: Saturday” he has no choice but to retire from touring because he is suffering from a rare degenerative muscular disease called inclusion body myositis (IBM). IBM mostly affects men over 50. It starts as weakness in the wrists and fingers — career-ending for a guitarist like Frampton — and can affects the quadriceps, feet, and sides. The disease’s progress is slow and not life-threatening, but it can lead to reliance on a cane or wheelchair. “Going upstairs and downstairs is the hardest thing for me,” Frampton said. “I’m going to have to get a cane… and then the other thing I noticed, I can’t put things up over my head.” Frampton first realized something was seriously wrong when he fell onstage three and a half years ago, then took a much worse spill on a boat with his daughter nearby. Along with recording while he can, Frampton will tour one last time, heading out this summer to hit venues like Madison Square Garden and The Forum. He is calling it a farewell tour, but fans shouldn’t approach it as a typical “farewell” tour, some of which wind up being the first of many. “I’m a perfectionist and I do not want to go out there and feel like, ‘Oh, I can’t, this isn’t good.’ That would be a nightmare for me,” he said.